This program is for infants and children under 5. 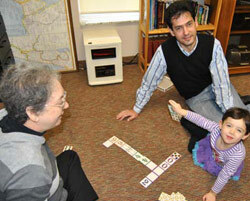 Bring your children and grandchildren for a fun half-hour with Rabbi Matt. Songs, tzedakah, motzi and eating challah are just a few of the things we do to welcome Shabbat. First Fridays starts at 6:30 p.m. on the first Friday of the month (except July). This program is offered free to members of our congregation. Sunday Mornings at 10:30 am (unless otherwise indicated) come Join us as we go around the year al galgalim (on wheels) learning about the Jewish holidays. 8 sessions beginning Sept 14 for Rosh Hashana and Yom Kippur. Training Wheels teacher (2014) Jan Tucker with Mikhail Kamerman and his daughter, Amelia. The program, a Jewish family education program created by Hadassah, lets parents and children ages 2-5 become partners in discovering the joys of being Jewish. Activities include songs, stories, crafts, games and holiday foods, all of which enable adults and children to experience together the joy of celebrating Shabbat and the Jewish holidays. Al Galgalim dates for 2017 / 2018 have not yet been set. Reservations are a must, as our space is limited.